This is Down On The Street Bonus Edition, where we check out interesting street-parked cars located in places other than the Island That Rust Forgot. Last weekend I was in Denver again, and I ended up on the streets of Golden for the Golden Super Cruise. It was early evening and I didn't have my good camera, so I figured I only had time to shoot a few cars before l ran out of light. We've all seen nine million Camaros and Chargers and deuce coupes, so I figured I could skip that stuff. "I'll just shoot AMCs and any Chrysler product with huge fins," I said, and that's just what I did. Jump away for the rest. They make Coors beer in Golden, and the brewery is a Manhattan Project-scale operation that looms over the town and fills the air with the smell of yeast. Last Saturday, however, hydrocarbons filled the air! 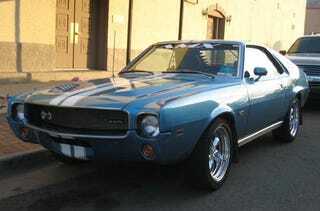 I found this '68 or '69 AMX (AMC experts, which year is it?) in beautiful condition parked on a side street. Even before I got close to it, I knew it would have a 4-speed and a 390. Note the "hyperspace" button on the shifter; yes, this car is probably a bit quicker than it was when it left Kenosha. The Renault Torino was based on the Rambler Rogue, and the mighty '69 SC/Rambler was, too. With that kind of heritage, what's not to love about this '66 Rogue, equipped with built 390 and 4-speed? I saw this Rambler cop car roll by, but never could find it holding still enough for photography. However, I was able to capture another Rambler of similar vintage in a nearby parking lot. Note the local dealer emblem on the trunk lid; it appears to be a lifelong Colorado car. I think this screaming tangerine '57 Chrysler got more attention from passersby than anything else I saw in Golden that eventing; it was very difficult to catch it without a half-dozen awed spectators drooling over it. These things came with 375-horse 392 Hemis back in the day, but I suspect it has something even more wicked today.